An American University professor who demonstrated how to use commercial 3D printers to create structures with active chemistry received an award from the scientific journal that published the research. Science and Technology of Advanced Materials awarded chemistry Professor Matthew Hartings the journal's 2016 Altmetrics Award for the attention the research garnered from mainstream and social media, according to a press release issued by the journal. Researchers created a chemically active 3D-printed structure that acts to mitigate pollution. Their experiment, created with many off-the-shelf materials common to makers, hobbyists and home enthusiasts, puts the power of chemistry invention into the hands of people taking advantage of the 3D printing revolution. They designed a small structure the size of handheld sponge and dispersed throughout plastic chemically active titanium dioxide (TiO2) nanoparticles. Using the same filament that hobbyists use in the printing process of 3D-printed figures, researchers added the nanoparticles. 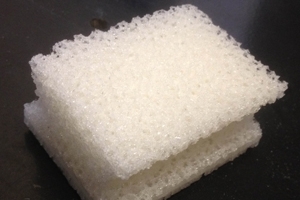 Using a 3D thermoplastic printer, ubiquitous in manufacturing, the researchers printed a small, sponge-like plastic matrix.